Checks the field levels present at a site in the context of international standards governing the protection of individuals in a private capacity or at their places of work. Electromagnetic radiation, reputed to interfere with equipment and harmful to health should be measured in accordance with numerous standards in force. The Chauvin Arnoux C.A 42 field meter has been designed with this in mind, while being supplemented by oscilloscope and frequency analysis functions. 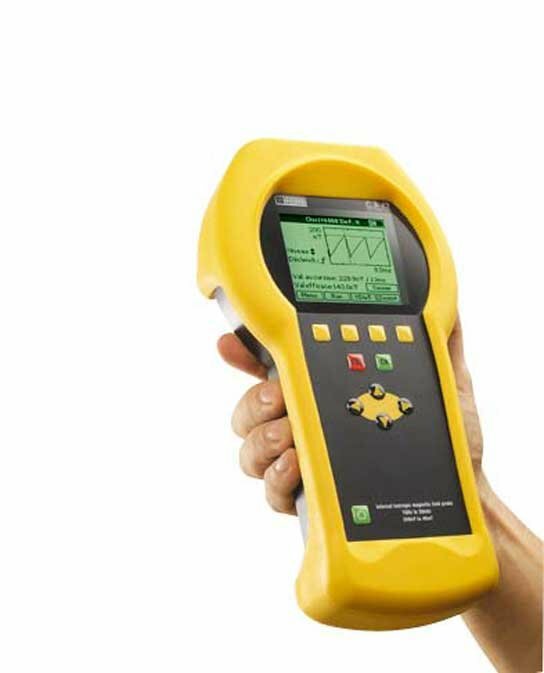 The CA42 fieldmeter is specially designed for measuring LF electric and magnetic fields and comparing the values measured with the requirements of the European directives and international standards. They can be used in both public and private contexts, as well as for checking the electromagnetic compliance of electrical equipment in industrial environments. The measurements made by the C.A 42, RMS or peak values and their components along three orthonormalized reference axes, are displayed either as absolute values (V/m or T, multiples and sub-multiples) or in normalized form (percentage of the reference values prescribed by the stored standards). Measurement dynamic range: 200 nT to 40 mT. Peak, RMS, mean values, Vx,Vy, Vz. Memory: 1MB (15,150 measured values, 80 oscillograms, or 475 frequency responses). Communication: RS232 serial port. Speed from 4,800 to 57,600 bauds, Xon/Xoff, RTS/CTS protocol. Liquid Crystal Display: 160 x 140 pixels, backlit, operating in the text and graphic modes. Dimensions: 266 x 144 x 60mm. Chauvin C.A 42 Warranty: 1 year. Protective sheath, 230 V line power charger, RS232 cord, Trigger cord, rechargeable battery pack, carrying bag, and LOG42 PC application software.